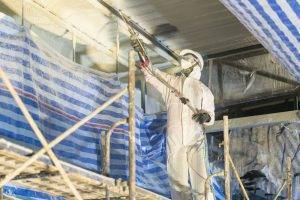 Selecting the right Spray Polyurethane Foam (SPF) insulation equipment for your foam roofing jobs can make a big difference in the outcome of any of your customer’s projects. In addition to picking the right spray foam machine, or proportioner, you must also find a reliable generator, air compressor system, and more to house in your mobile rig. A generator is essentially the heart of your spray foam rig. SPF proportioners have become incredibly advanced in recent years; as such, their technology requires reliable and consistent power to help keep the electronics running safely and seamlessly. When searching for the right generator for your spray foam roofing business, review the total power requirements for each piece of equipment in your spray foam rig. These pieces may include a sprayer, an air compressor, heaters, air conditioners, lights, and other necessary tools. It is crucial to factor in additional costs and components for installing elements including a main on/off disconnect, wiring, and breaker panel for your spray foam rig. You also will want to plan to properly exhaust the diesel fumes outside of your mobile spray rig. Our team of experts at Intech Equipment & Supply suggests building a dividing wall that separates your generator and work area to protect your team from any exhaust. An SPF spray system has multiple pieces of equipment that require the use of an air compressor. You may also opt for a high-pressure breathing system, often vital when spraying in confined spaces. The majority of SPF contractors often utilize an electric air compressor that takes power from their generator. Many SPF contractors commonly purchase a 5–7.5 hp reciprocating compressor, which provides 17–23 CFM (0.5‒0.6 m³/min.). Many manufacturers today build generator and compressor combo units developed specifically for use in the SPF space. While an air compressor is an integral part of your spray foam roofing arsenal, it is also crucial to remove any moisture that results from your air compressor. Most SPF spray guns are “air purged.” What does this mean? In laymen’s terms, it means the residue of the A and B materials is released out of the mixing chamber with air supplied from the compressor. As a result, any moisture in the air increases gun maintenance. A strategically planned mobile spray rig should always have a high-quality moisture trap and electric refrigerated dryer. Building the right rig for your company’s needs take time and forethought. Of course, you can tweak individual aspects if you need, for instance, more hose length down the road. However, taking the time now to plan carefully can help save you time and money. Shop Intech Equipment & Supply’s online store for an extensive range of spray systems from the best manufacturers in the SPF industry. Browse spray foam machines, hand tools, power tools, SPF equipment, roofing safety equipment, parts, and much more. New customers enjoy 10% off your first purchase in our Online Store! Our company operates six facilities in three different time zones across the U.S., from New Jersey to California, giving us the opportunity to extend business hours for order fulfillment and provide quality customer service and technical support. Check out our online sprayfoam equipment store or contact us today for more information.